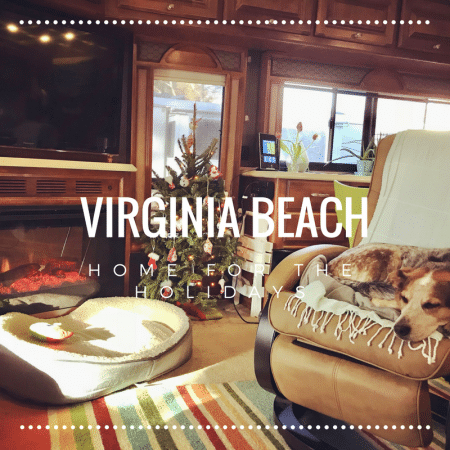 After an awesome start to our full time RVing life, we spent the holidays in Virginia Beach, camping at the Holiday Trav-L Park. We chose this park as it was close to family, and the “Green Acres” section had nice cement pads. We knew it would be raining (it always does in November and December) and didn’t want to spend our time wading through mud and ponds. The campground was pretty nice! Huge laundry, couple of pools (unusable in winter of course) and a bunch of friendly people. We chose a site at the end of a row, and happened to be neighbors with a horse farm next door. It was pretty awesome waking up to the horses grazing in the paddock. There is also a 1 1/2 acre dog park! The fur-kids loved it. We had quite a few things planned for our return – like doctors appointments and such. Nothing as exciting as an annual doc visit! All went pretty well. I (Sonya) had to have a couple of skin cancers removed. I booked the appointment later in our 8 week stay, so when they said they needed to send things off for biopsy, wait for results, and then found out that I needed surgery I left it kind of late… I literally had to get the stitches removed in Florida. And fortunately they called to say all the cancer was removed, so I didn’t need to go back in (that was a good thing as I got the call when we were in St. Augustine, FL). We also had a chance to spend time with our 6 year old niece and nephews. I took Harley to his Tae Kwon Do every week and was able to watch him get his yellow stripe belt, and we enjoyed a campfire night with the twins, Nick and Avery. John went to Star Wars with Nick, his mum and John’s dad. And I took Avery to a pottery painting day. So lots of family time in between Thanksgiving and Christmas as well. We were also fortunate enough to spend time with some of our RVing friends – Jenny and Bill, and Kim. Jenny and Bill joined us for Thanksgiving at my sister’s house, and Kim drove down from the Blue Ridge Mountains for a couple of day visit (I think she just wanted to warm up a bit!) It is always awesome hanging with friends! What would we do differently next year? So the plan was to head up to Maine for summer, then come back down to the Virginia Beach area for the holidays. We arrived the first week of November at the beach. And left on December 28th to head South. As much as we loved seeing family, we didn’t see as much of them as we had expected to. Everyone was working and had activities going on, so it was hard to fit back into their schedules. We will probably stay for a little shorter time in 2018. Perhaps arriving later in November. We would also book any doctor appointments that would have potential follow-ups (like dermatologists) early on in our stay versus near the end. We like the Trav-L-Park, but it is expensive. The alternative is the KOA, but it looked crowded and muddy and messy. So not sure we’ll go there instead. We’ll have to see. We had an amazing rollercoaster ride in 2017. Once we were on the road, we had an amazing time and found out that we really enjoy this lifestyle. The lead up to getting on the road was challenging. And we are so glad those days are behind us! 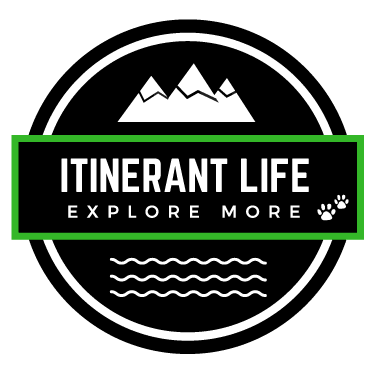 Now on to our 2018 adventures! For more great info on camping and glamping in Virginia, check out this post on All The Rooms blog!